During the night, a dog was outside my tent snarling and barking for sometime, nothing was done, if it had half a brain it would tire of this and leave, that it did. Though, not before having visions of fighting a dog with my knife. Someone told me along time ago the best thing to do is grab a dog by its front legs and pull them apart, this breaks their brisket and it’s all over for the assailant. Up early, and thankful for the shelter the awning offered, I was able to pack a dry tent. Again a heavy dew was on the grass. My stove would not work properly, so chocolate cream biscuits were had for breakfast. This stove thing could become a real problem if I can’t fix it. It seems to be getting air in the line and a mixture of air and petrol through the jet is producing a less than reliable flame, often it will just go out. Once packed I headed off, not before the dog than was hanging around my tent during the night turned up, the bark was instantly recognisable. Back on the road, a perfect asphalt surface was enjoyed, it was such riding pleasure after days of gravel. Much to my displeasure after 8km, this soon reverted back to gravel, they are doing a huge amount of upgrading on this whole road, it was now in places reduced to a track. I felt every rock. My leather Brooks saddle has been a saviour, anything offering lesser seating comfort would have been an undoing. There were houses scattered all through this country. Most people owned a few cows and were seen wandering along the road with their donkey carrying two milk churns to a central point to be picked up by a truck. Some supplies were bought at Cruzcunga, a pueblito with one tienda and a milk delivery point, a tanker truck was seen loading here. Many of these people were very shy, one woman would not let me photograph her mule after I asked her, another girl ran away as I was approaching. I had been in the never never for 6 days but though I didn’t think my appearance was that frightening. The woman were mostly dressed in their skirts, back shoes, a straw or black hat with a knitted shawl. Infact most woman seen just hanging about had a stick with a ball of cotton or wool on the end and were spinning thread from it, others were casually knitting garments on the roadside. The scenery was rolling hill country covered in lush green grass, higher up stone fences provided paddock boundaries, these were very old and appeared to have received little recent maintenance. Breakfast come lunch was enjoyed at a tiny pueblito, soup and coffee. The soups now contain beef or chicken and pasta with a very watery but tasty base. Coffee is still just hot water in a cup with a jar of instant coffee at your table. Nearing the top of the range a man was wandering along the road with his donkey with two milk churns on its specially constructed saddle. This animal food is called suero. He was quiet talkative, anyway in the churns was a kind of whey, it was used to feed all his farm animals, the pups, chooks and pigs. Many people are wearing these sandals made from car tyres, which last forever and are very cheap. Put simply they are materially, very poor, most cook over fire and maize is used as the staple in most foods they eat. By now I had my full gloves and raincoat on. Once this area was scaled, it was finally all downhill to Cajamarca. Soon the town off Encañada was reached, not before stopping and talking to people having a picnic on the roadside overlooking the town, they had driven up from Cajamarca for the day. They were really interested why I was in Peru and what I thought about their country. The kilometres were being recorded quiet rapidly now with this continual descent. I was riding standing on the pedals to get a better view of the potholes ahead, much concentration was needed as was the continual reduction of speed. Encañada was a hive of activity, every Sunday people bring livestock to town to sell, the streets were lined with people selling anything they could. Cows, pigs and mules were being led along the main road, cars were at a standstill. One lady at a stall was selling coca leaves by the bag full. A pound was 8 soles. It is widely chewed here. Some bananas were eaten, though by now I felt I could make it to Cajamarca. The road from Encañada was all asphalt. Leaving there a huge open valley was passed through, wheat was the main crop being grown here. 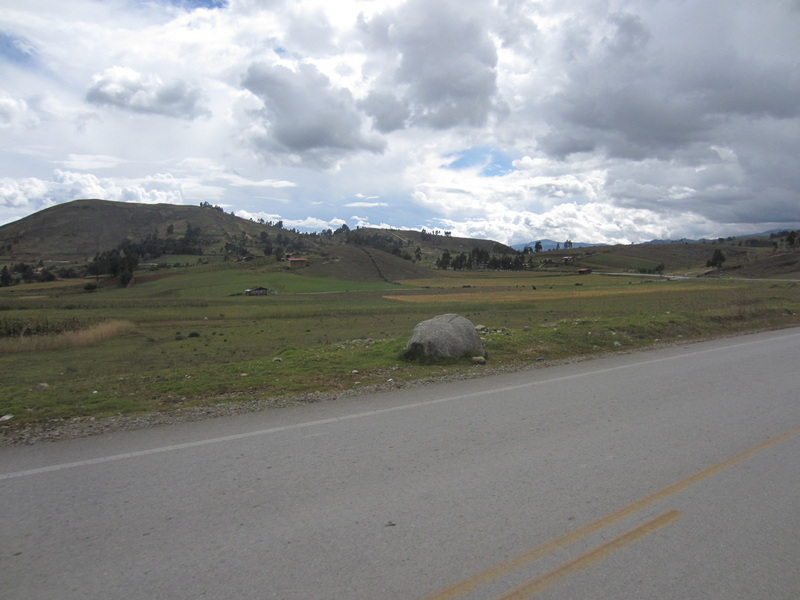 Once this was traversed, the actual descent into Cajamarca began, the road was smooth and had great cambered bends as it descended. This was a fitting end to the last five days of mostly gravel. Riding down here, caution was thrown to the wind to some extent, the brakes were used sparingly, whilst the adrenalin flowed freely, it was great. 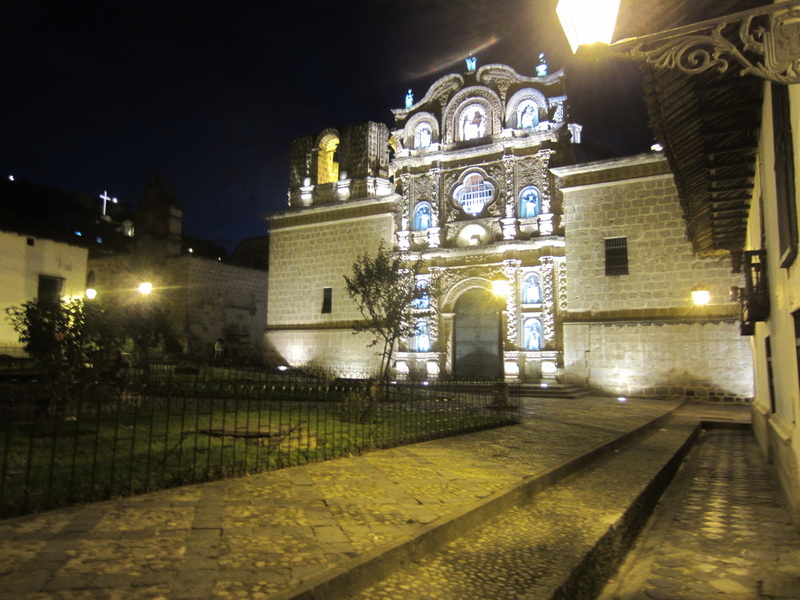 It was a built up passage into down town Cajamarca, with Los Baños del Inca the start of it. A pineapple and mandarins were bought at a stall. Once in town as usual I head to the park and begin my search for accommodation. I always look for ground level hotels, at a reasonable price with internet. Everything here was up stairs or too expensive. It took two hours to find a place. I had a good look over town in the process, rode through all the markets, ate at street stalls enjoying chocolate, fried chicken, apples, bananas and got a feel for the place. Finally a lady at one place told me about a place on the Plaza de Armas The hospedaje Belen. It is super basic, but a minute walk to the park. Prices ranged from 130S to 20S where I am. Once packed I headed to the Centro Commercial Quinde, a large western type mall, like any mall anywhere, complete with food court etc. Here I needed an external hard drive for my Go Pro movies which are rapidly filling my computer hard drive. A 500Gb item was purchased, these types of things here are so expensive. It was needed. Soups, Peruano coffee, batteries and canned fish were bought at the huge supermarket. From here dinner was had off the park. I will spend two nights here. Hopefully get my stove working properly, this is a priority. It will be a welcome rest after a journey that will never be forgotten. I completely stripped my stove down in the hopedaje and found an O-ring not mentioned in the manual was worn. It now works perfectly. I am wrapped. The rest of the day was spent wandering about while time time was spent at the Hotel Cajamarca on their wifi bringing this to you. It rained this evening, quite heavy.